This is a catch-all option for miscellaneous items and fees that don't fit into other item categories. Note: This item is available in QuickBooks Desktop only. To add this as an item, you will need to add a new item within the Items app, and choose Other Charge. When you select Other Charge, you'll be taken to the New Item Screen. The fields are described below. Item Name/Number: Identify the item or fee by name or by number. Subitem of: An Other charge may be considered a subitem of an existing item already in your QuickBooks account (for example, it may be considered an unspecified charge for a particular item or service, e.g. environmental handling fees). You can use this drop down list to associate it with an existing item. Active Other Charge Item: Click on this option to ensure this item appears in the "Active" filter view in the Existing items grid, and so it will also appear in drop down lists throughout Method. Sales description: Include a description of what item was purchased. Use it to include additional information that isn't covered in other fields on this screen. % (Percent Checkbox): Used to specify the rate as an added percentage to your cost. For example, set the rate to 50 and check-off the Percent box for an item that costs you $100; the rate charged to the customer will be $150. Income account: Choose which account will be associated with the customer payment. This list comes from QuickBooks. 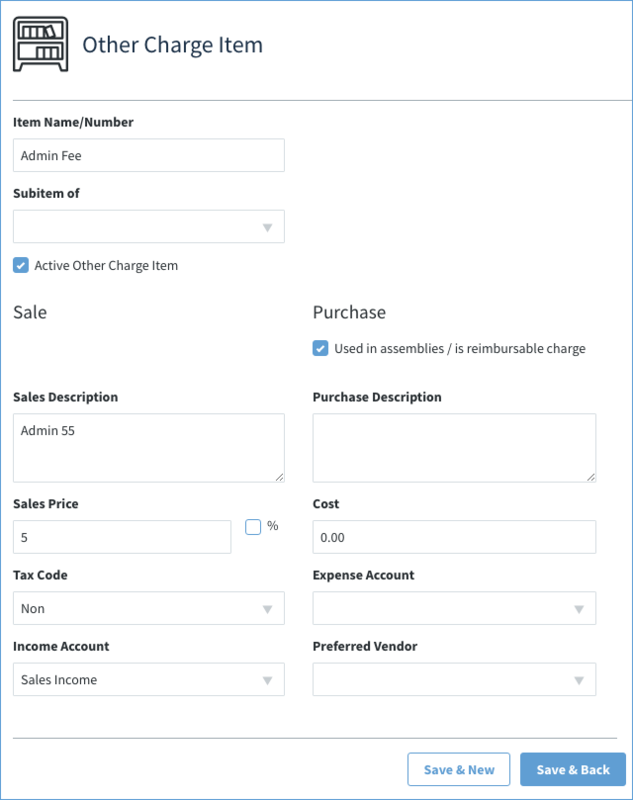 Used in assemblies/is reimbursable charge: Check this box if the item you're creating is either used to assemble other items, or is a reimbursable charge. This record is flagged in QuickBooks. Once checked, the fields below it will display. Purchase Description: Include a description of the item. Use it to include additional information that isn't covered in other fields on this screen. Expense Account: The account debited for the purchase. These options come from QuickBooks. Preferred vendor: The vendor you usually use if applicable. These options come from QuickBooks. Save & Back: Saves the new or edited item and returns to the previous screen.